Hampton Court Palace was a royal residence from the 1520s when King Henry VIII took over its development from Cardinal Wolsey, and its many royal occupants over the years have granted the palace its stunning furnishings, tapestries, and paintings. Hampton Court Palace also contains an important part of the largest private collection of art in the world, the Royal Collection, which is the property of Her Majesty Queen Elizabeth II. This collection is on full display and contains material from the 16th, 17th, and early 18th centuries. In 1689, Sir Christopher Wren demolished large parts of the Tudor palace and began building a new palace for King William III and Queen Mary II, but by 1760, George III became king and abandoned Hampton Court as a royal residence. In 1838, Queen Victoria opened the gardens and state apartments to the public free of charge. It is no longer free (see ticket information) but is well worth a visit. The Hampton Court Palace estate includes 60 acres of formal gardens, requiring 200,000 flowering bulbs each year and another 40,000 plants grown in the nursery. Hampton Court Palace and the Formal Gardens are closed December 24, 25, and 26 each year while the Informal Gardens are closed December 25. Home Park is open year-round, however, the hours of operation are subject to change depending on the season, so always be sure to check the official website for more detailed information. General photography, without flash, for personal, non-commercial use is allowed within the palace and gardens, with the exception of the Chapel Royal and Royal Pew. Audio guides are included in the ticket price and can be collected from the Information Center in the far left corner of Base Court. Languages offered for this service include English, French, German, Italian, Spanish, Dutch, Japanese, Russian, and Korean. Hampton Court Palace is next to the River Thames to the south west of London, and while there are WPSA riverboats to the palace from Westminster in the summer months—a journey that takes four hours—there are also a variety of other means of public and private transport that can get you there. Use Journey Planner or the Citymapper app to plan your route by public transport. South West Trains run services direct from London Waterloo to Hampton Court, and the journey takes only 35 minutes, resulting in a 200 meter walk across the bridge from the station to the palace. The train service passes through Wimbledon station, where the London Underground District Line begins, and Hampton Court is in Travel Zone 6. If you do travel by South West trains they have an offer for a combined travel and Palace ticket. That also means you've got your entry ticket in your hand so won't need to go to the Ticket Office when you arrive. Be sure to check out local bus routes for the following lines, which all run past Hampton Court Palace: 111, 216, 411, 451, 461, R68, and 513. From Heathrow Airport take the 111 bus, from Gatwick Airport take a train from the airport station to Clapham Junction and change to the Hampton Court train, and from London City Airport, take the Docklands Light Railway to Canning Town and then the Jubilee Line to Waterloo, then catch the Hampton Court train from there. Tickets can be purchased on the day or in advance from the Palace ticket office—located just inside the main gates on the left-hand side of the drive—or in advance from any staffed South West Trains station. To save money on trips to Hampton Court Palace, you can buy a London Pass, which gives you unlimited admission to loads of top London attractions including Hampton Court Palace, Kensington Palace and the Tower of London, or you can book online in advance on the official website and oftentimes score discounts on tickets. If you're traveling with luggage or a backpack, Hampton Court Palace has some lockers, located off Clock Court, where hand baggage and small rucksacks or overnight bags can be left (locker size: 45cms wide x 45cms deep). A £1 coin is required to use them, which is returned after use. Large bags or suitcases may be left at your own risk in the Warders Office by the West Gate. Please speak to the Warders when you present your ticket if you would like to use this facility. With over 500 years of royal history, Hampton Court Palace has something to offer all visitors, from the Tudor Kitchens to the famous Andrea Mantegna painting set "The Triumphs of Ceasar," you won't want to miss these highlights on your tour of the grounds. From 1529, the Tudor Kitchens comprised 55 rooms, covered 3,000 sq ft, were staffed by 200 people providing 600 meals twice a day for the Royal court. What's more, King Henry VIII's court would have drunk an incredible 600 gallons of ale every year. Explore this section of the palace then venture into the Great Hall, England's last and greatest medieval hall which once served as King Henry VIII's dining hall for his staff and is still decorated with the tapestries hung to impress visiting ambassadors. We always think of King Henry VIII as a large man with many wives but he was an attractive young man and was married to his first wife, the Spanish Catherine of Aragon, for 20 years and they were very much in love. They had 6 children die leaving him with no male heir and Henry saw this as God punishing him for marrying his brother's wife. Hence the story we know: the new Church of England was formed so he could divorce and his further five marriages in his quest to produce a male heir. You'll also want to check out William III's and the Georgian Private Apartments, both of which were the results of different monarchs living in the palace. Mary II and her husband William III commissioned Sir Christopher Wren to rebuild a third of Hampton Court, which includes the "necessary office" (the king's toilet). The Georgian Private apartments now host the Cartoon Gallery, which was designed to display the large Raphael cartoons, but instead features 17th-century copies as Queen Victoria gave the originals to the Victoria and Albert Museum. The Chapel Royal has been in continuous use for over 450 years, and it's constantly changed depending on who occupied the palace. When Cromwell lived at the palace he removed the ornate stained glass, and Queen Anne later put a wooden altar in front of the removed windows. The Hampton Court Palace Gardens offer 60 acres of gardens that run down to the River Thames, with another 750 acres of tranquil royal parkland. Look out for the Privy Garden—King William III's garden restored to its 1702 glory, and the Great Vine, which was planted in 1768 by the celebrated gardener "Capability" Brown and still produces a yearly crop of black grapes that are sold in the palace shops in early September. The Maze, the most visited attraction in the gardens, takes an average 20 minutes to reach the center. Also, look out for the Royal Tennis Courts, the oldest tennis court in England, which is still used daily. 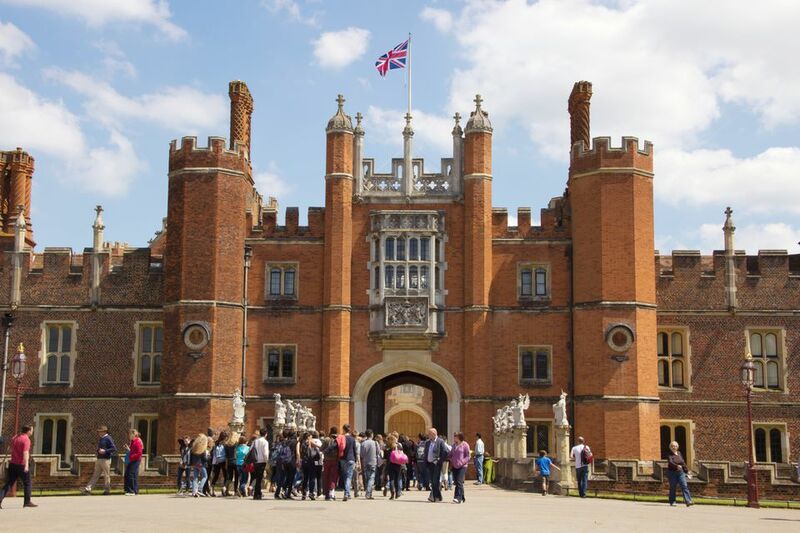 The Hampton Court Palace is a family-friendly attraction that entertains thousands of tourists each year and features activities focused on kids of all ages. For families with small children, or who are carrying buggies already, pushchairs or buggies may be taken around the palace and may also be left at the left luggage facility off Clock Court, which features a Buggy Park. Speak to a warder if you wish to use the lifts that are available for anyone unable to manage the stairs. There is a Family Room off Base Court for the little ones to play freely within the confines of the palace. There is a similar children's play area in the Tiltyard Café, which is not available during school holidays, and there are also a variety of Family Trails available from the Information Centre for young children to do as they go around the palace. However, not all the Family Trails are little ones. There are also some of older children that will enhance their knowledge of the Tudor period, and four family audio tours are available to guide children over 6 through the palace. During school holidays, the palace also offers costume guided events and craft activities that are aimed at children aged 5 to 11. Dressing up clothes are available in the Information Center, where you collect your free audio guide. There are costumes for the whole family and it can make it easier to spot each other when the Palace is busy if all of your party dresses up. However, guests cannot come in costume as there are costumed actors in the Palace every day and the staff doesn't want others to confuse you with them. The Maze is also recommended for all ages, and admission to the Maze is included in your palace ticket. Don't forget the gardens are beautiful and a great place to have a family picnic—you can bring your own meal or buy sandwiches and snacks from the Tiltyard Cafe! Hampton Court Palace is very large so be aware visitors wishing to see all of the palace interiors and the gardens will travel over two miles. Since Hampton Court Palace is a historic building with uneven surfaces, it may be difficult to traverse. However, many of the staircases are wide and shallow because of William III, who was asthmatic, built them so they would be easier for him to climb! Most of the routes within the palace are accessible to visitors unable to climb stairs as there is an elevator to take visitors to the State Apartments on the first floor. Speak to any warder for assistance. Manual wheelchairs are available for use within the palace and single-person scooters are available for use in the gardens only, but neither can be booked in advance. Visitors with disabilities are admitted at the standard rate but an accompanying carer, personal assistant, or a companion is given a free entry—please notify the admissions staff when purchasing your tickets if your accompanying person is a service person. Guide dogs are also welcome. There are accessible toilet facilities in Base Court, Fountain Court, on the first floor, in the Wilderness Garden, and the Tiltyard Cafe. Nine disabled car parking spaces are available on site on a first come, first served basis. Two of the four shops are accessible to wheelchair users: the Barrack Block Shop and the Garden Shop. Those unable to get to the Young Henry VIII exhibition in the Wolsey Rooms can see a virtual tour—be sure to check out the full access details on the exhibit's official website.